Attics are among the most often neglected spaces in most homes. Commonly home to insulation, piping and the occasional spider, many homes don’t use their attics as a living space, so they are generally not thought of unless there’s an issue. 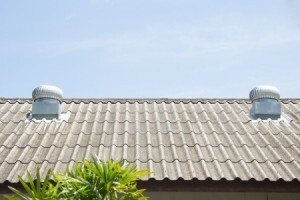 However, as we move away from summer, it might be time to start thinking about how your attic’s ventilation works before warm weather returns next year. Most attics are designed to trap heat. They’re one of the last lines of defense that help keep the heat inside your home during the cold months, but that same trapped heat can also build up to extremes during the summertime. In fact, attic temperatures can climb enormously during hot, sweltering days in the summertime – sometimes even reaching temperatures in excess of 160 degrees F! This excessive heat can penetrate into your home, costing you money on your cooling bill as your air conditioner has to work harder to combat the baking heat seeping down into your home. One of the best ways to help you save during the hot weather is by ensuring that you have proper attic ventilation in place. An effective ventilation system will blow this hot air out of your attic, helping to keep temperatures more moderate and saving money on your cooling bills. Plus, proper exhaust can also help keep air flowing through your attic and blow out humid air which is full of water vapor – the same kind of vapor that can lead to dampness and moisture in your attic, allowing molds to breed and degrading your home’s insulation over time. There are a wide variety of ventilation systems available that can be customized for any kind of home. Whether solar-powered vents, roof-mounted ventilators or ridge vents that allow heat to exhaust through the peak of your home, there’s a perfect solution to fit your needs. To find out more about ventilation systems, contact Jun’s Mold Remediation today!